CoinSwitch.co, which is an India-based cryptocurrency conversion service, is a bit of a tough nut to crack legitimacy-wise. Yes, the operation looks legit and yes, the majority of the feedback available on it is positive as well. Still, there are some dissenting voices in its bitcointalk thread, and one of these posters does not stop short of calling the service a scam. It also has to be pointed out that most of the above mentioned positive feedback originates from India. As said above, CoinSwitch.co is a cyptocurrency conversion service, meant to help users convert between more than 100 supported cryptocurrencies, from the most popular, such as Bitcoin, to the lowly Aragons and Golems. As such, the site features a simple and attractive interface, which is geared towards giving users an immediate estimate regarding the conversion in which they are interested, straight from the homepage. Hold your bitcoins though: the mechanics of an actual conversion are much more intricate than that. Like other similar services, CoinSwitch works with a number of crypto currency exchanges, to find the best possible conversion conditions. These conditions are defined by the price of course, but security and conversion times are also considered. 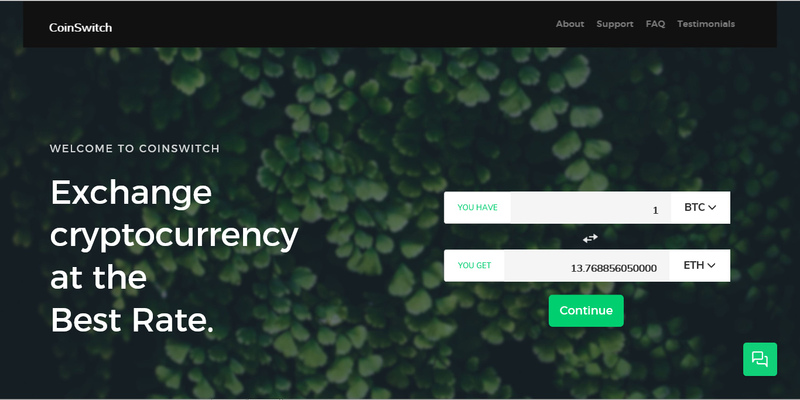 CoinSwitch.co representatives have claimed that there are no additional costs associated with conversions, on top of what the exchanges charge. Still, some users have complained that conversion costs are indeed rather steep and that the price-making isn’t without its pitfalls either. The main selling point of the operation seems to be the fact that users do not have to create an account to convert, and thus they do not have to share any potentially sensitive personal information. According to the CoinSwitch website, all users need to do is to select the input (e.g. Bitcoin) and the output (e.g. Ethereum) currencies, and to provide a receiving address. After that, the funds can be sent and the conversion is performed. Users are allowed to select the exchange they prefer for their conversions too, as CoinSwitch offers up a comparison of the price-rates of various crypto exchanges. Users can then track their conversion on the blockchain as it unfolds. At this point, it is difficult to say for certain whether you should trust this operator or not. As said above, the majority of the feedback is good, but there are some who claim the operator swindled them on the conversion fees. At any rate, the worst outcome is that you get short-changed. Still, it’s never a pleasure to get swindled in any shape or form. CoinSwitch supports over 100 currencies, which means that its selection of supported pairs exceeds the 5,000 mark. As said above, users are not required to open an account at the site to make use of the services and the intuitive user interface compares the prices featured by various crypto exchanges, nudging users towards the best possible choice. The operation knows every exchange in terms of availability, so it can in fact make suggestions based on this aspect as well. According to its reps, CoinSwitch.co does not charge any fees in addition to the fees of the providers, so it doesn’t cost extra. The fact that no extra fees are charged poses the question: how does CoinSwitch.co generate revenues then? Something does not seem to add up on this front, especially because there are obviously no subscription-like fees associated with the service either. Other than that, the service seems to work. Another red flag would be the complaints of a couple of users at the bitcointalk forums. The main stage for complaints against CoinSwitch is bitcointalk, and the complaints are focused on conversions done at an unfavorable rate. The client who posted the complaint essentially received fewer coins than he expected to/was told he would receive. CoinSwitch.co is not a scam in the classic sense of the word, so it won’t just take your coins and run. The SimilarWeb global rank for CoinSwitch.co is 449,270, indicating it’s rather popular. Much of its visitors seem to be Americans (more than 20%). The United Kingdom, France, Germany and India are other countries where this service is popular. CoinSwitch’s service is definitely a useful one, especially for those looking to diversify away from Bitcoin while staying in the crytocurrency realm. It may not always work out ideally, but the service is definitely legitimate. Still, given that it’s been launched only recently, the best course of action is the one suggested at the end of the bitcointalk thread, which is to wait it out and see. Do you have any experience or knowledge to share about CoinSwitch? We encourage you to share your feedback in the form of a comment below! To receive intuitive reviews and critical scam warnings directly to your inbox make sure you subscribe to ScamBitcoin.com! I have used CoinSwitch to diversify my alt coin portfolio and had no problems with it. Transactions have all gone smoothly. I like the ability to swap easily from one coin to another. I also like the fact you don’t need an account. Registering with Coinbse was a real chore and the same goes for most other big exchanges. 5 stars from me for good service. Looks like a total scam on first sight, but we’ll investigate. It seems to be a SCAM! Here’s our Bitcoin Finder review.